1 : Make a side ponytail close to the nape of the neck. 2 : Split the hair into three sections. 3 : Fishtail Braid each of the sections. 4 : Pull out the folded pieces (the bits that you bring over when plaiting) on each side to double the size of the plait. 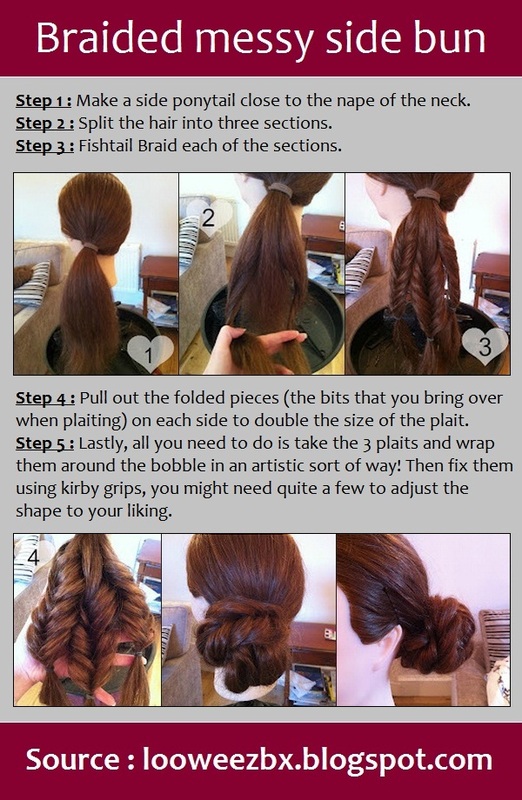 5 : Lastly, all you need to do is take the 3 plaits and wrap them around the bobble in an artistic sort of way! Then fix them using kirby grips, you might need quite a few to adjust the shape to your liking.